We are dedicated to helping dogs. We have several programs that benefit canine and animal charities. Rescue By the Dozens Our Rescue By the Dozens program is a unique way to help your favorite rescue when you purchase any of our collars, leashes, or harnesses. For each item purchased you can name your favorite rescue group. When 12 items have been purchased in that rescue's name we will send them a free collar. The collars give back much more than their monetary value. A rescue can choose to use the collar for a dog in need, add it to an auction basket, or resell it to an adopter or supporter. And the purchases are accumulated from any order naming that rescue. I'll use our local SPCA as a an example. If someone buys a collar and a leash then 2 units will be credited. If that person's friend buys another collar, and names the sae rescue, then another unit is credited until 12 units are totalled. And it will cost the rescue nothing. We even extend this to our wholesale purchasers although the ratio for wholsalers is 20 points per collar. Each collar or leash you purchase will give you the option to type in the name of your favorite rescue! It's even better if you can add their address and phone number. We will keep a running list of all rescues mentioned and send an appropriate item when that rescue has had 12 items named in their honor. All you need to do is to type the name of your rescue in the optional field that reads 'Add your favorite animal rescue to our Rescue By the Dozens program'. You only need to add it once per order, but it is helpful to us if you can include your charity's name each time you place an order. Please note, this is ONLY for rescues, not for breeders or kennels. Sammy's Chemo Collar Check out our information on the Sammy's Chemo Collar page. It will tell you all about how we donate a portion of each item to canine cancer research! 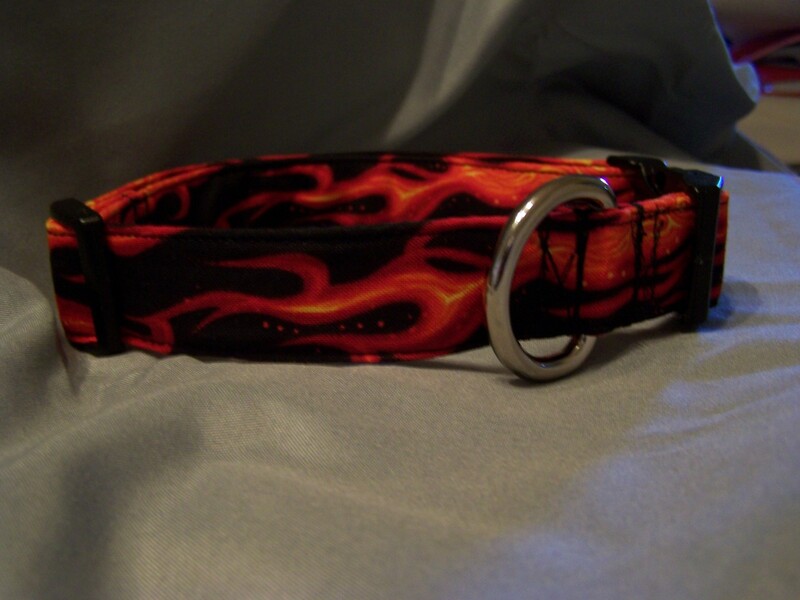 In addition, all of our flame themed collars help as well. For each flame collar purchased we are donting 10% of the proceeds to canine cancer research. Rescue Groups We sometimes can provide collars and leashes to your rescue group at a reduced cost depending on the quantities purchased. These will be great sellers if your group has an online store or point of sale station at your facility. Please email us for details. Because Rescue Me Collars is a small home based business we are not a position to directly donate collars to rescues outside of our already established programs. Donations We donate a portion of all our sales directly to rescue charities. We're starting small, but with your help that will grow.